So we are back from our getaway and I will love to share with you about what we did in LEGOLAND and Hello Kitty Town! But before that, here's a flash giveaway for those of you who might be keen to watch The Incredible Book Eating Boy. 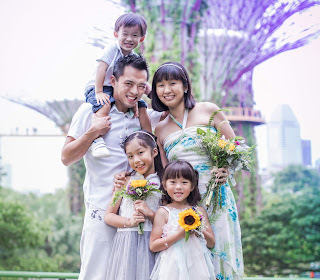 I have a family package of 4 Category 1 tickets (worth S$232) to give away! Henry loves books. No, he doesn't like to read books, he likes to eat them. Big books, picture books, reference books - if it has pages, Henry chews them up and swallows (red ones are his favourite). The more he eats, the smarter he gets and he's on his way to being the smartest boy in the world. One day he feels sick to his stomach, the information is so jumbled up inside and he can't find a way to digest it! Find out how Henry, with a little help from his parents, eventually found a way to enjoy books without using his teeth. 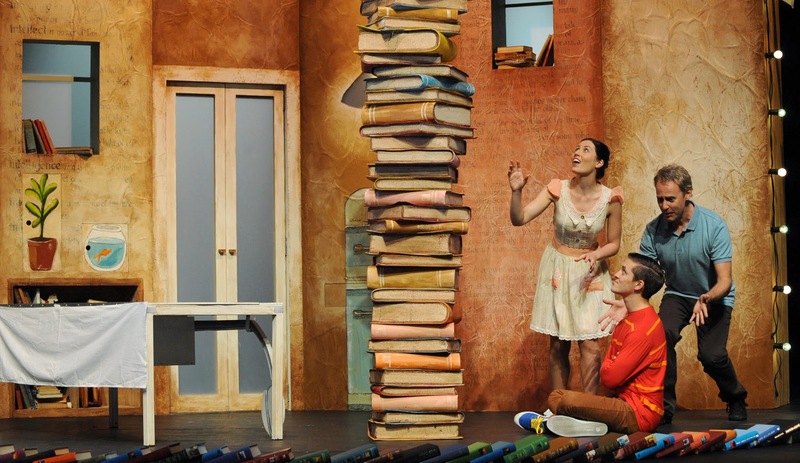 A captivating story that encourages reading, finding success through hard work and not taking the easy way out, this show is recommended for children aged 3 to 8 and their families. Watch how a cast of three from Australia uses song, movement and puppetry to bring Oliver Jeffers’ quirky, beautiful and much loved story to life. 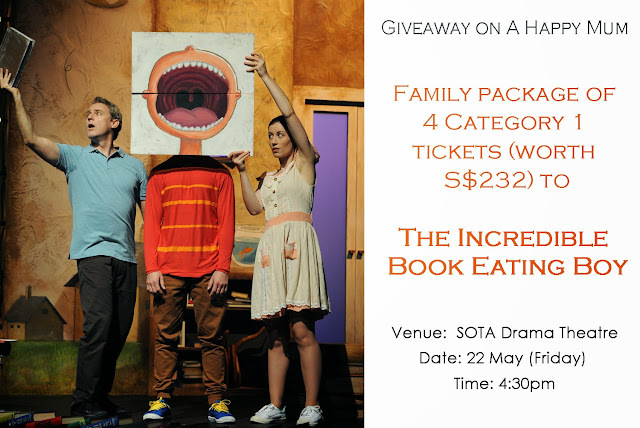 All seats in the house for the opening show on May 20 (Wed) at 9.45am are priced at $38 only (excluding SISTIC fee). 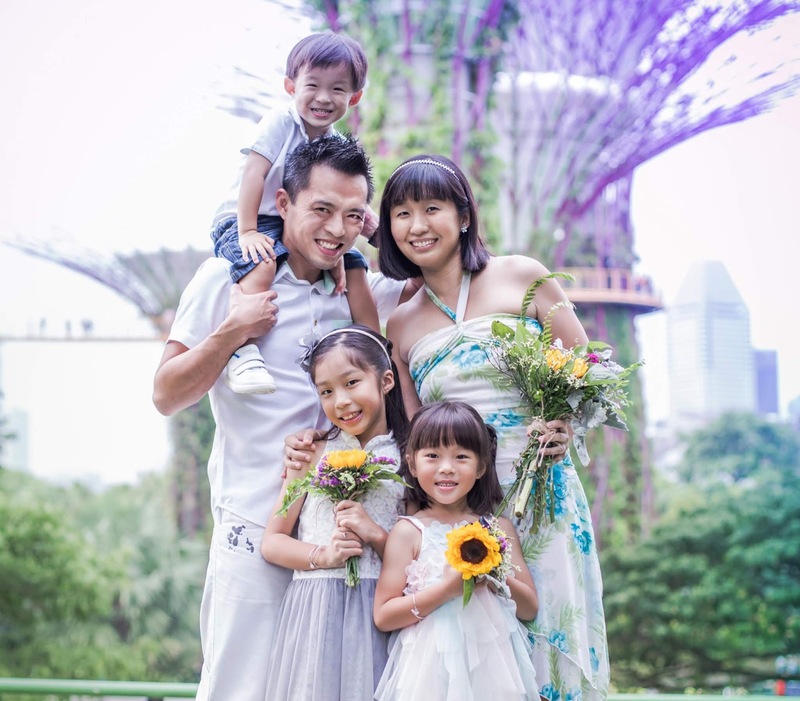 Limited seats are available for this ‘Parent and Toddler’ promotion! A highly popular drama workshop will also be held on May 23 (Sat). Led by an experienced Faust Leader, children will be exposed to a variety of games and drama techniques designed to encourage imaginative young minds to explore and bring the story alive before they catch the show on stage. The drama workshop is at $80 per child, inclusive of show ticket. Email info@faustworld.com.sg for more information and to register. *Prices excludes SISTIC booking fee. 10% discount is available for groups of ten or more. There is no minimum age for this performance and all audience members must have their own ticket. Tickets can be purchased SISTIC's website here or through the hotline 6348 5555. For more information, check out this production via ABA Productions official website here or their Facebook page. Now, here's your chance to win tickets to this incredible show! This giveaway is open to all readers who can make it for the show, please make sure you are able to turn up! To participate, leave a comment in this blog post with your name and email address. Indicate in the Rafflecopter widget that you have commented and to increase your chances of winning, you can choose to carry out the rest of the options. Best of luck! a Rafflecopter giveaway Disclosure: We were invited to watch The Incredible Book Eating Boy and received complimentary tickets. All opinions are our own. My daughter loves this book! The illustrations r lovely. Liked, shared, followed, retweet and regram! Hope to watch this with my kids. Oliver Jeffers is such an amazing author!! !